ALXION has been established in 1987 with the challenge to design and manufacture precise and compact servomotors dedicated to direct drive without gear of automated industrial axis. Quickly, ALXION has appeared as one of the undisputed leaders in high torque permanent magnets brushless motors for direct drive thanks to its famous range of FC motors manufactured at more than 4000 units and installed worldwide. 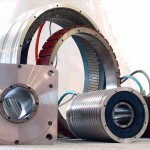 Later on, thanks to technicological advances in permanent magnets and to its mastership in electromagnetic and thermal simulation softwares, ALXION has developed new ranges of torque motors, more performing yet regarding compacity and equipped with high diameter crossing hollow shafts, ST motors, as well as frameless rotor-stator STK units dedicated to mechatronics integration in one set of the motor, the load and the industrial process. That integration is made possible by allying motor compacification and direct driving. ALXION continued to be a pioneer when designing the first AC permanent magnets generators, also called permanent magnets alternators, for small wind turbine applications. Those PM generators are supplied in frameless stator rotor units dedicated to simplifying, compacting and increasing efficiency of small wind turbines operating in direct drive without gear. The growth of frameless STK stator rotor units is very fast and more than 6000 of them are already installed in the field worldwide, used for direct drive of automated industrial axis as well as generators for small wind turbines in direct drive and more recently for small water turbines in wave energy, stream energy and tidal energy. ALXION motors and alternators are characterized by their compactness, their accuracy and lowest cogging torque, their high torque-to-weight and power-to-weight, their high efficiency and their reliability demonstrated by the numerous years of intensive use in-the-field with entire satisfaction. ALXION motors and alternators are manufactured in ISO 9001/2000 workshops.